Rosette-Leaf Sedum is a Himalayan hern with slender or thread-like roots. Leaves are arranged in rosette, spoon-shaped, round at the tip, entire 6.5-19 x 2-6 mm. Flowering stems are 7-10 cm high, unbranched, deciduous. Stem leaves are spoon-shaped, obovate, blunt, broadest at the tip, 3-6 x 1-3 mm. Flowers are borne at branch-ends, in reduced panicle or thyrse, 3-7-flowered. 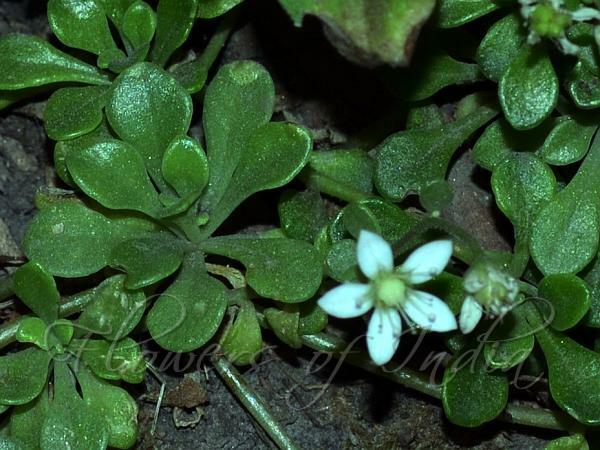 Flowers are 5-merous, small, hairless; flower-stalk 3-9 mm long. Calyx 5-lobed, sepals ovate, fleshy, blunt, 1.8-5 x 1-1.8 mm. Flowers are 5-petalled, petals elliptic, pointed, fused, white, membranaceous, 3.7-6.5 x 1-1.7 mm. Stamens 10, in two whorls, basifixed, shorter than and adnate to the petals, 2-5 mm long. Nectar scales oblong, 0.3-1 x 0.1-0.3 mm. Carpels free, 2.5-4 x 0.5-1 mm, style slender, 0.5-1 mm long, stigma capitate. Follicles 5, erect, free, 4-5.5 x 0.8-1.5 mm. Seeds 0.5-0.6 x 0.1-0.2 mm, ellipsoid, small, brown, with longitudinal striae. 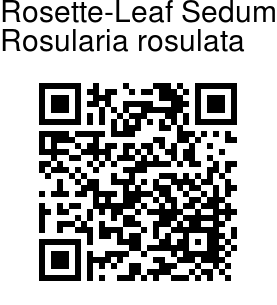 Rosette-Leaf Sedum is found in the Himalayas, from Kashmir, Punjab, Kumaun to Nepal, at altitudes of 3000-3250 m. Flowering: April-July. Identification credit: D.S. Rawat Photographed at Renuka Ji-Haripurdhar Road, Himachal Pradesh.